Yep, we're on the road again, but just a quick two day trip this time, back to Missouri. I wanted to have lunch in the car, because I now know we shouldn't have to stop for gas until about Springfield, Missouri. I'm sure there will be bathroom breaks in between, but at least those should be quicker if we don't have to get food too. This was one of those bentos that sort of came together after I started assembling it. I sliced the cantaloupe and scooper in the yogurt first, then made the sandwiches. I was going to make some kind of sandwich decoration, but started slicing a few strawberries when I noticed, they looked like ears! So from there, the fox appeared! The kids have identical lunches because I'm driving and don't want to listen to it. ;o) They have ham & cream cheese sandwich on multigrain rounds, topped with fox faces (white cheddar for the eyes and organic blueberry fruit leather for the rest of the features). 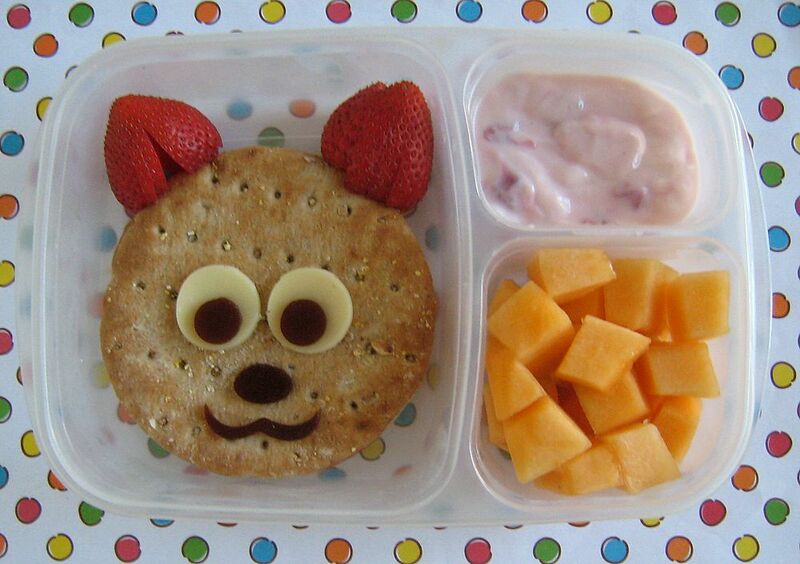 The ears, of course, are strawberries, then strawberry yogurt, and cantaloupe. Not in the bento, we have pretzels and granola bars for snacks, along with bottled water, and coffee for me. For the record, Faith thinks it's a cat and Ben thinks it's a chihuahua. I was thinking fox, but I really am not sure. On the road, I still prefer our Easy Lunchboxes, also available on Amazon. As mentioned, they fit in my cooler nicely and they are sturdy enough for the kids to use them on their laps.